Hey friends! Whew, the book is FINALLY turned in!! I’ve been thinking I’d like to write about the cookbook-writing process here…would that interest you? I have a lot of thoughts that I would love to share if you’re interested. I get to see the manuscript one more time, for several weeks in May, and I believe at that point it will be all put together with photos + recipes…how exciting is that??!?! The one thing that isn’t finalized is the name…if you can believe it. 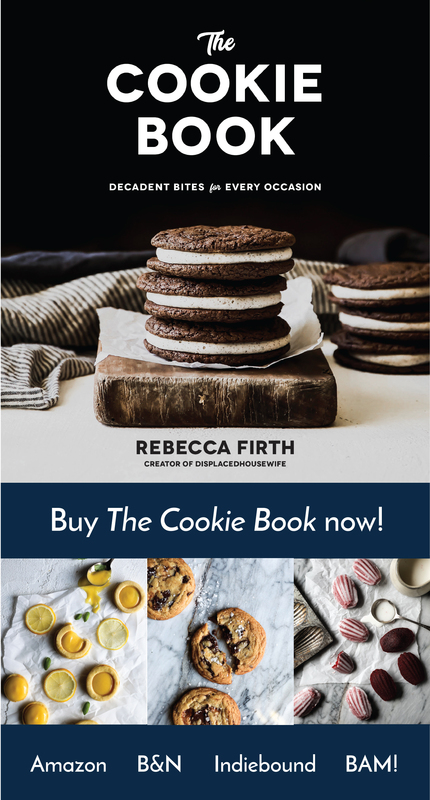 So here are some of the names being thrown around: Decadent Cookie Cravings, Cookie Cravings, The Cookie Book, The Gourmet Cookie Book and Ooey Gooey Gourmet Cookies. Tell me what ones you like — I really want to know!! Let me know your thoughts in the comments below (or email me). I definitely have some favorites but there are a lot of people invested in the book at this point, so we have to balance everyone’s wants/desires/ideas. We have a release date as well!! This shouldn’t change…and if it all goes as scheduled it will be released just after mid-September. I’m going to hold off on the official release date until we know we’ve made it through these final stages without a hitch. And I can’t wait until we can start PRE-ORDERS!! Can you even!?!?!?! 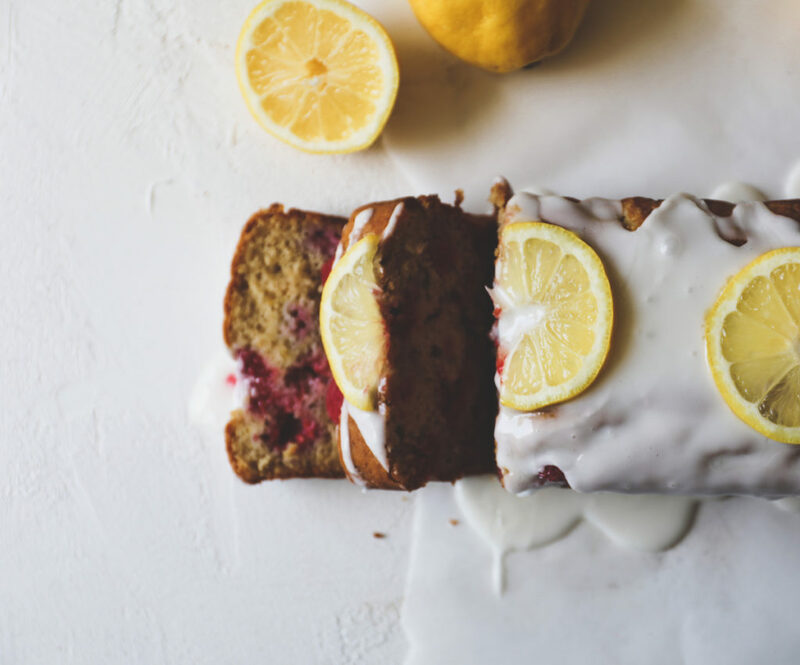 Let’s chat about this lemon raspberry tea cake… I had to make something for a collaboration I did with All-Clad, but I didn’t have to create an original recipe for them (it was more about a pretty video and showing how to use a product of theirs). I wanted to do something fresh and spring-y and I ended up not liking any of the lemon cakes I was using so I created this lemon raspberry tea cake. She’s super easy (nothing too fancy in the ingredient department) and LOADED with juicy raspberries and bright, fresh lemon flavor. I love how she puffs up, bronzes and the top gets all cracked and crinkly. I am so happy to get back to the routine of writing recipes and photographing them and writing about it here. I have truly missed it!! I have some exciting recipes to share coming up + working on some fun things to do (I’m thinking giveaways, signings, etc.) once the book comes out. I’m also working on a pre-order gift for everyone that orders the book before it’s released (Would you want to see fun videos of me making the more complex recipes in the book (I have a fun idea for this)? A print from the book? More secret recipes?). Once that gets finalized I’ll share it here first. I hope your day is aces! Let’s bake some lemon raspberry tea cake, shall we? Preheat the oven to 375 F. Grease a 1.9 qt loaf pan** and line with parchment paper. In an electric stand mixer fitted with the paddle attachment***, mix the granulated sugar, oil and butter on medium for 4 minutes or until completely blended together. With the mixer on low, add in the eggs, one at a time, taking care that each is well blended before adding in the next. Add in the lemon zest, vanilla and mix for 1 minute more or until combined. Scrape down the sides and bottom of the bowl to make sure everything is well blended. In a medium bowl whisk together the flour, baking soda, cinnamon and sea salt. With the mixer on low, add 1/2 the flour mixture to the sugar mixture and mix until combined. Alternate between adding 1/2 the buttermilk and the remaining flour mixture (ending with the last of the buttermilk), making sure each addition is fully combined before adding in the next. Take the bowl out of the mixer and use a spatula to fold in the raspberries until evenly distributed throughout. Scoop the batter into the loaf pan filling until just ¾ full. Drizzle the remaining 1 teaspoon of sugar + 1 teaspoon lemon juice evenly over the top. Let sit for 15 minutes before putting in the oven; this helps the cake get a wee more rise (and is optional). Bake for 50-55 minutes in the center of the oven or until a toothpick comes out clean. You want the top to be puffed up and golden and a toothpick inserted into the center should come out mostly clean, with the tiniest smidge of cake on it. Let cool in the tin for about 30ish minutes, then use a butter knife and the parchment overhang to help get it out of the pan to finish cooling on a rack. Once cool, whisk the glaze together in a small bowl. You want the glaze to be thick, so add extra milk sparingly. Drizzle over the top of the cake and let set for 15-30 minutes before serving. If feeling frisky, place three, super thin lemon slices over the top. 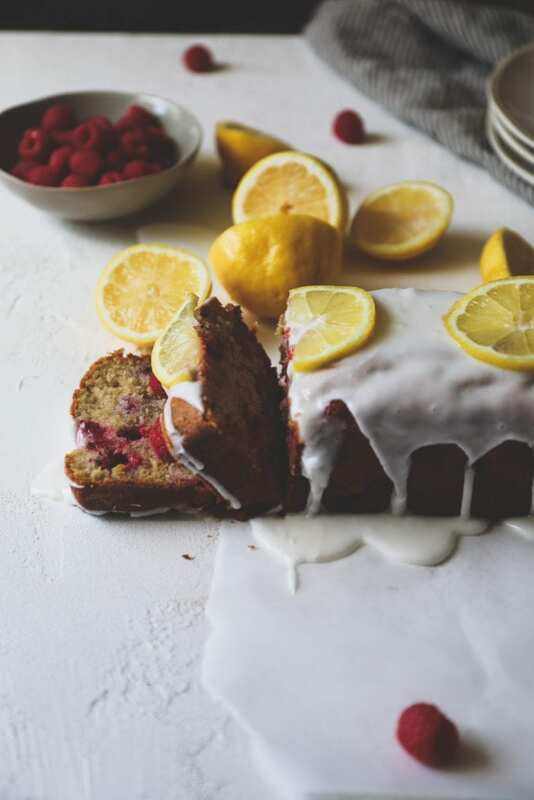 If you make this lemon raspberry tea cake, tag me on social @displacedhousewife #displacedhousewife so that I can see your gorgeous creation!! *I got a note from someone that their raspberries sunk to the bottom. I didn’t have that problem when testing, but baking can be like that sometimes! You can toss your berries in 1-2 tablespoons of all-purpose flour before adding to the cake batter and this can help remedy that! **I used this pan from Ikea (not sponsored). Something in the 9X5-ish range should work (don’t go smaller). Just take care not to fill over 3/4s full, as the cake will rise quite a bit. 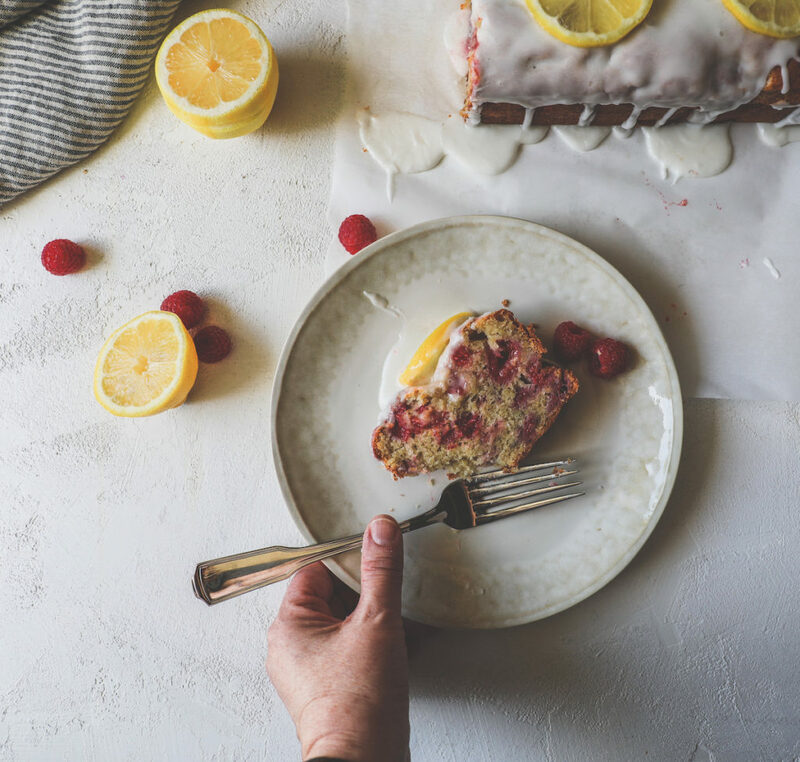 ***This lemon raspberry tea cake was originally created using the All-Clad Prep&Cook (for a sponsored Instagram post)…if you’re using the Prep&Cook, use the kneading/crushing blade with the P3 pastry program and run the machine for several minutes at step 2, then add your dry ingredients to the bowl alternating with the buttermilk and run the machine for several minutes more until blended. Fold the berries in by hand. ***This can also be made with a bowl, spatula and some arm muscle. 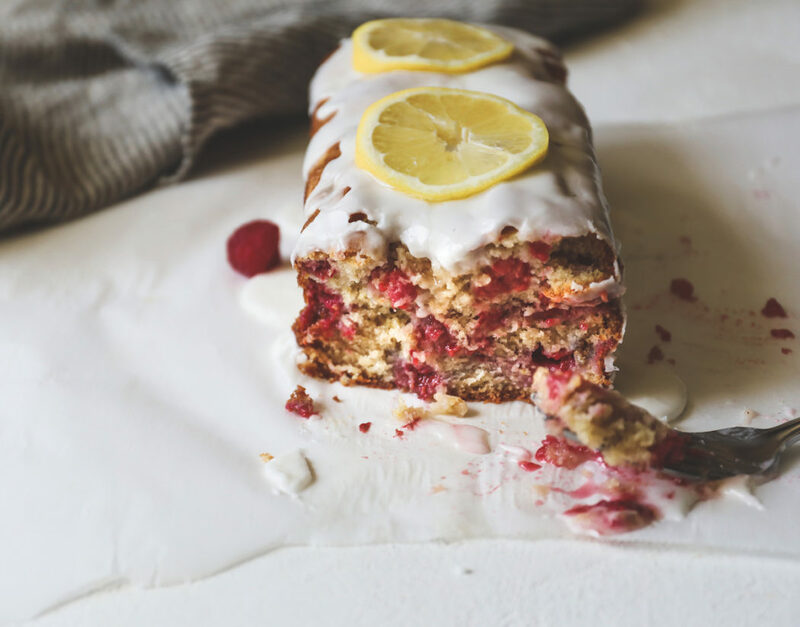 This lemon raspberry tea cake is super easy (nothing fancy in the ingredient department) and LOADED with juicy raspberries and bright, fresh lemon flavor. In a medium bowl whisk together the flour, baking soda, cinnamon and sea salt. With the mixer on low, add ½ the flour mixture to the sugar mixture and mix until combined. Alternate between adding ½ the buttermilk and the remaining flour mixture (ending with the last of the buttermilk), making sure each addition is fully combined before adding in the next. Take the bowl out of the mixer and use a spatula to fold in the raspberries until evenly distributed throughout. Scoop the batter into the loaf pan filling until just ¾ full. Drizzle the remaining 1 teaspoon of sugar + 1 teaspoon lemon juice evenly over the top. Let sit for 15 minutes before putting in the oven; this helps the cake get a wee more rise (and is optional). Bake for 50-55 minutes in the center of the oven or until a toothpick comes out clean. You want the top to be puffed up and golden and a toothpick inserted into the center should come out mostly clean, with the tiniest smidge of cake on it. *I got a note from someone that their raspberries sunk to the bottom. I didn't have that problem when testing, but baking can be like that sometimes! 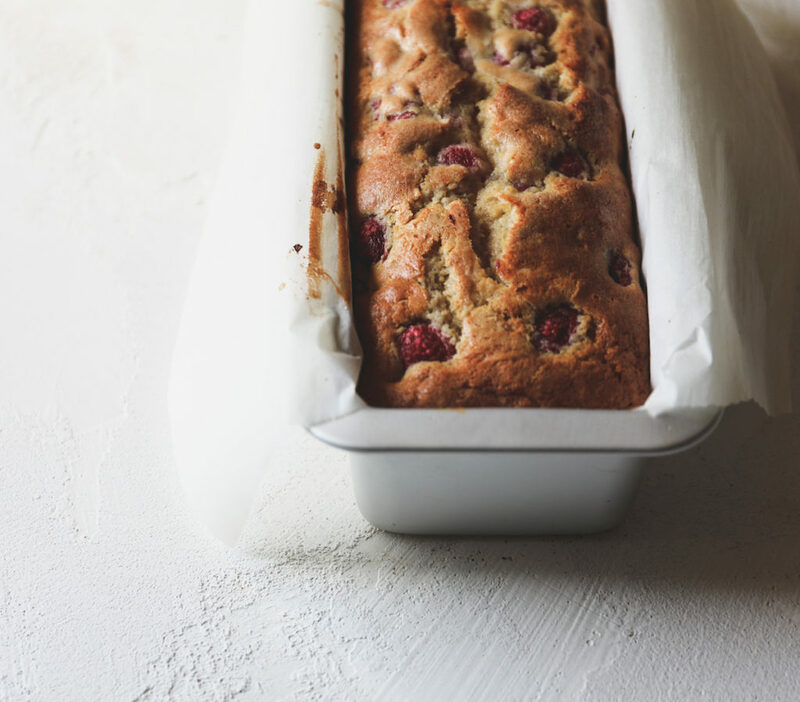 You can toss your berries in 1-2 tablespoons of all-purpose flour before adding to the cake batter and this can help remedy that! **My pan is from Ikea. Something in the 9X5-ish range should work (don't go smaller). Just take care not to fill over ¾ full, as the cake will rise quite a bit. ***This lemon raspberry tea cake was originally created using the All-Clad Prep&Cook (for a sponsored Instagram post)...if you're using the Prep&Cook, use the kneading/crushing blade with the P3 pastry program and run the machine for several minutes at step 2, then add your dry ingredients to the bowl alternating with the buttermilk and run the machine for several minutes more until blended. Fold the berries in by hand. I’ve been taking Broma Bakery’s photography course and loving it. These photos have a less contrasty look than my usually photos…what do you think? It’s been fun to play around with editing and learn some new photography tips. Let me know in comments or via email where you’re located…it will be helpful in terms of planning where I’m going to go when my book releases! That’s it. Be back next week. Yay! I went to visit my BFF last week, and the first thing out of her mouth was ” You’re going to bake while you’re here, right?” I made two of these beautiful cakes. My friend’s husband practically devoured the entire cake the first night! This is one gorgeous cake that tastes divine. A keeper for sure! I will be making this on the weekend for my own dessert loving husband. Thanks for all the divine recipes, Rebecca! Can hardly wait to see your book! congratulations – i can’t wait to see the finished book! i’m leaning towards cookie cravings or the cookie book and would love to hear about the process. would also love to meet you if you make it to boston! i’m in portland, maine (2 hours north) so frequently in boston. congrats again! so happy for you! xo! Sooooo excited for you Rebecca! What a huge accomplishment, I can’t wait for a copy, soooo much baking fun ahead. I love the simplicity of The Cookie Book or The Gourmet Cookie Book…but I think any will do fabulous! And this cake Love it! The Cookie Book is my fav. Would love videos if something is a little difficult to explain. Loved your scone vids!! Love ALL your recipes. You are my favorite to follow! Your recipes are the best. Love the detailed instructions. Omg, where do I start?? 1) The Cookie Book -it matched your no frills, no muss, simple and direct approach to the tums you create. 2) I would take any gift for a preorder buuut an exclusive print would be divine! 3) Videos sound fun. The only reason I know how to make a scone is because of your detailed writing so detail away! 3) I’m in Nor*Cal (near Sacramento or Bay Area) and would come anywhere to see you. Omg congrats on the journey and I can’t wait to get my hands on that book! HI I’M SO GLAD YOU’RE BACK ON THE INTERNET. Can I first say how THRILLED I am that you turned in all in and all your hard work is coming to fruition! So so excited for you & I can’t wait to preorder the book. I definitely love Cookie Cravings & The Gourmet Cookie book for the titles. 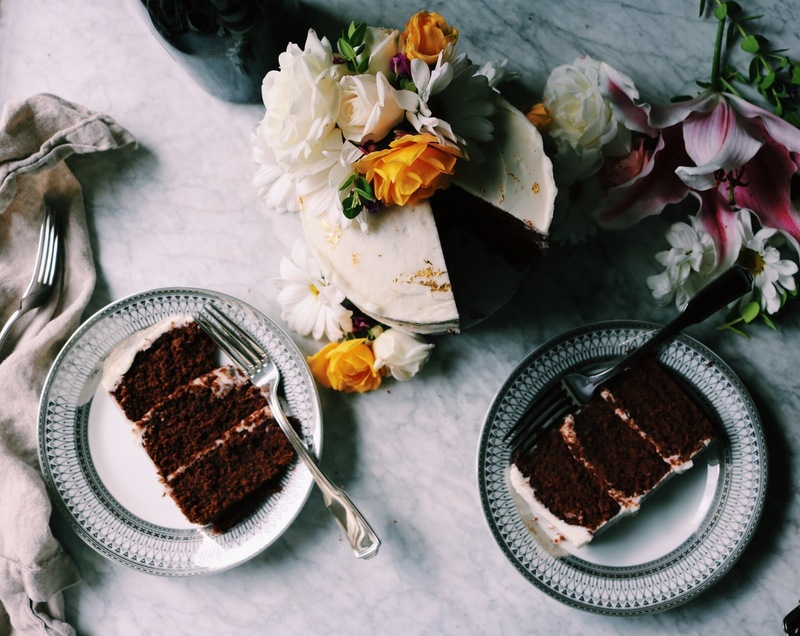 This cake- I’ve been waiting to see this recipe and it’s beggin to be made and eaten. So I do believe you’ll find me at the farmers market this morning hoping to find raspberries for this cake. Definitely Cookie Cravings – it’s the best for your ultimate delicious cookies! This is how I see you, gourmet & decadent with your incredibly successful, delicious, creative recipes. Although, I also see you as my sweet and salty baker. Love the pictures! Can’t wait to see your book! 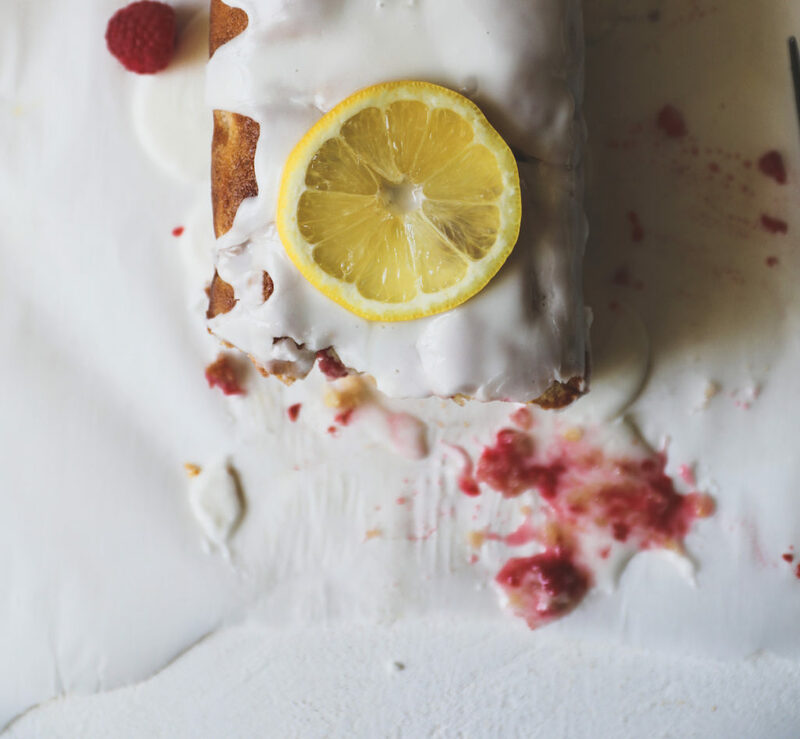 And, I’m making this lemon raspberry cake tomorrow for brunch. Love all the zest. Perfect timing! Thanks for sharing this recipe. May I ask what type cinnamon you used ? I’ve been considering an”upgrade” to my assortment of baking spices and cinnamon is on my list. Thanks again. BTW, your video of this recipe was excellent but me thinks that I will not be buying a $1,000.00 tabletop kitchen appliance anytime soon but I must admit that you make making this cake look awful easy using that thing. Cookie Cravings or The Cookie Book. So happy and excited for you. I can’t wait to get my copy. Definitely Gourmet Cookie Book. So proud of you. Gorgeous cake! For the book I like the smplicity of The Cookie Book or Cookie Cravings. NO – Ooey Gooey Gourmet Cookies. To the point!! I like it!!! Thanks!! 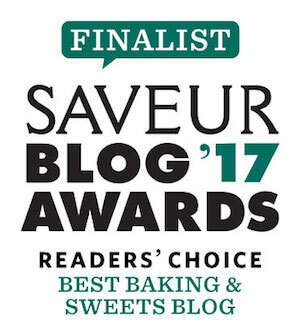 I’d have to say for me, Decadent Cookie Cravings is the winner because it is reflective of the kind of sinfully delicious & at the same time, beautiful recipes that you make. I am hoping to pre-order your book when the date is set. Though I live on the other side of the planet (literally!) can’t wait to see all that you’ve put into this book. xoxo all the way from the Maldive Islands. I’d have to say for me, Decadent Cookie Cravings is the winner because it is reflective of the kind of sinfully delicious & at the same time, beautiful recipes that you make. I do plan on pre-ordering your book when the date is set. Though I live on the other side of the planet (literally!) can’t wait to see all that you’ve put into this book. xoxo all the w ay from the Maldive Islands. I’ve missed your lovely face in my inbox! This cake looks fresh and springy, perfect for the warm weather we are finally having here. Would love to hear about the book-writing process! Thank Ron!! I hope you do! Love this! Would be so delicious with my morning tea! And I like The Cookie Book and The Gourmet Cookie Book! This looks so yummy!! I can’t wait to test the recipe out!